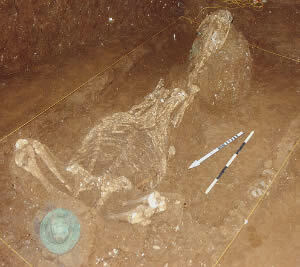 The grave unearthed in north-east Greece. A grave containing 16 horses and a two-wheeled chariot dating back to Roman times has been unearthed by archaeologists in the north-east corner of Greece. The remains of two people were also found in the grave near Lithohori, in the Kavala region. Greece's Culture Ministry said 10 of the horse skeletons were complete and the animals appeared to have been arranged in pairs. The war chariot dated to the first or second century AD and was considered a find of considerable importance. 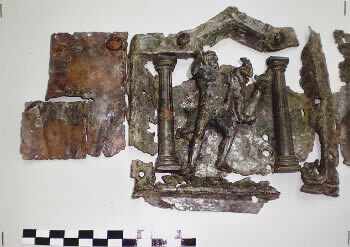 A container was found holding four copper coins dating back to the 4th century AD. 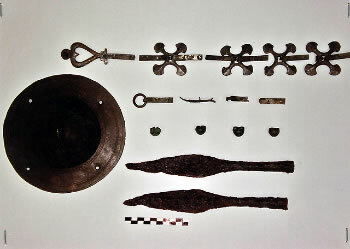 The excavations have also unearthed bronze wedges and bronze fittings, including a horse shield. The chariot had a frieze relief in bronze, showing three of Hercules' labours: the Cerberus dog, the wild boar of Erymanthian, and the Stymphalian birds. 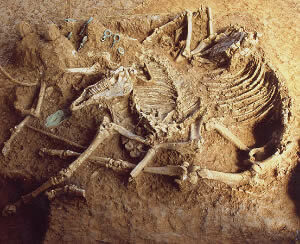 In 2007, archaeologists had found a chariot wheel placed underneath two horse skeletons in the same area. 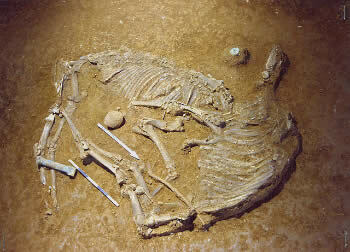 The grave contained 16 horses and a chariot, and the remains of two people. Excavations unearthed bronze wedges and fittings.